I’m an older Metalhead that listens to everything heavy. My catalog consists of bands dating back to the inception of the Heavy Metal genre to newer bands that experiment with all of the technology available to musician these days. A lot of “old school” fans like me (I’ll admit it, I’m considered “old school” at my age) get really excited when they hear a new release from a band that hasn’t forgotten how this genre was built. So when I got the new album from XTHIR13N to review, I was hooked from the first guitar lick. These guys are what I love so much about rock ‘n roll; a band that incorporates influences of old, while keeping the sound current and relevant, and then puts their own spin on it. 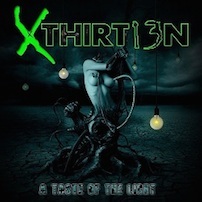 With the release of their debut album, “A Taste of the Light”, and with what has to be one of the coolest band names around, XTHIR13N bring to the table a really tight sounding hard rock/heavy metal record to start, what should be, an extensive career together. This group of rock veterans possess an eclectic collection of influences and experience and meld their sound into something that really stands out in this saturated, “cookie-cutter” hard rock/heavy metal genre. Consisting of Tim Aymar on vocals, Rollie Feldmann on guitar, Joey Torres on guitar, Taz Gardner on bass, and Johnny Osborn on drums, XTHIRT13N delivers a power metal sound that reminds me a lot of old SAVATAGE, as well as classic JUDAS PRIEST, and occasionally I pick up on traditional hard rock sounds, reminiscent of GODSMACK and DISTURBED. Aymar delivers a standout vocal performance on “A Taste of the Light”, giving the listener a Rob Halford-esque, upper register tongue lashing, while at times, sounding like a combination of John Oliva (SAVATAGE) and David Draimen (DISTURBED). This guy has the pipes that could make XTHIRT13N a household name in the near future. The guitar tracks are amazing, and track-by-track, take you through a gamut of styles, with power chords, wailing leads and screaming solos. The drums and bass are spot on, with thundering bottom end power that is, far too often, overlooked and/or taken for granted. “A Taste of the Light”, is a breath of fresh air in the over populated hard rock/heavy metal arena and is in my Top 10 albums of the year so far. XTHIRT13N should be on every Metalhead’s radar as one of the best new bands of 2014 and one of the bands that has the potential to become a headliner very quickly. If you haven’t bought this album yet, what the hell are you waiting for?